NEW CONCORD — After taking a pair of losses earlier this week, Heidelberg softball split a doubleheader with Ohio Athletic Conferences foe Muskingum Saturday. The Student Princes took a 6-0 win in game 1 before being edged out 2-1 in the nightcap. After two scoreless innings, Heidelberg (21-11, 11-5) got a base hit from New Riegel graduate Leah Bouillon to get the offense going. Renee Lovett followed with an RBI double to take a 1-0 lead. Two batters later, Casey Moore drilled a two-run home run to center giving HU a 3-0 lead. Heidelberg tacked on two unearned runs in the fourth after a misplayed ball by Muskingum’s (21-8, 7-7) defense. Bouillon legged out an infield single to start the top of the sixth before moving to second on a groundout. She advanced to third on a wild pitch and came across on a Shelby Miller single to left giving HU a 6-0 lead. Kaitlyn Moore tossed seven scoreless innings and scattering four hits. She struck out six and walked just one in the win. Lovett and Miller led off the nightcap with a walk and forced Muskingum’s pitch out of the circle. Casey Moore used a sacrifice bunt to advance the runners before Lovett crossed the plate on a wild pitch. Heidelberg took an early 1-0 lead. The Muskies plated their first run of the day in the fourth inning to tied the ball game with a sac fly. In the bottom of the fifth, a two-out double plated a runner for the 2-1 lead and the win. HU sits third in the OAC with a twinbill left on the docket against Wilmington. The top four teams will advance to the conference tournament held May 4-6. BEXLEY — The Heidelberg women’s lacrosse team traveled to Capital for its final road game of the season. 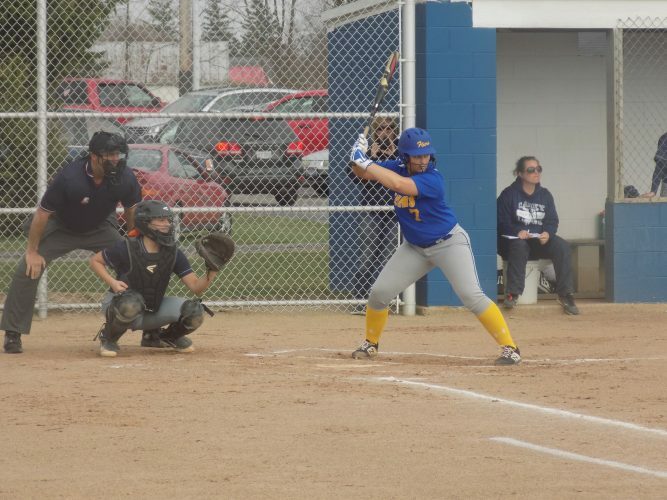 The Student Princes fell 20-2 to their Ohio Athletic Conference rival Saturday and fell to 6-7, 2-4. The Crusaders improved to 11-2, 4-2. Capital took a 6-0 lead to start the game before Dana Dudley finally got HU on the board. The junior’s goal came less than 10 minutes into the game and was her 22nd of the season. The Crusaders went on another 6-0 run followed by Dudley’s — and Heidelberg’s — second goal of the game on a free position shot. Capital continued its momentum into the second half to rout the Princes. The Heidelberg men’s lacrosse team suffered a 21-4 loss at the hand of Ohio Athletic Conference rival Capital Saturday. The Crusaders controlled the pace of the game from the start to improve to 8-6, 4-2 while the Princes fell to 7-7, 1-5. Capital scored the first four goals of the game before Nick Selfridge netted HU’s first goal. The goal marked his 34th of the season. Alex Bruder fed Liam Weaver a pass after racing down field. Weaver managed to sneak his way through the Crusader defense and cut the deficit to 5-2. Capital killed any Heidelberg momentum with 11-straight goals to close out the first half. The Crusaders continued the fast tempo in the second half while allowing only two goals. Chris Storrs netted his third goal of the season in the third period for Heidelberg. Matt Wernerspach fed Selfridge for his second goal of the game. Heidelberg was outshot 72-29 and committed 26 turnovers in the loss. With playoff hopes on the horizon, Heidelberg kept its eyes on the prize with an Ohio Athletic Conference sweep of Muskingum Saturday. The Student Princes edged out the Muskies 3-1 in the opener before taking a 6-2 win in the nightcap. In game 1, Trevor Adkins tossed a much needed gem for Heidelberg. He pitched eight innings of three-hit baseball, fanning 11 batters. He did give up a lead-off homer in the top of the fifth that broke the scoreless tie. Heidelberg (19-11, 7-7) responded with a pair of runs in the bottom of the fifth. Jordan Beacorn and Marc Ochoa singled to lead off the inning followed by a Joe Walton walk to load the bases. Joey Rydzewski knocked in a run with a single followed by an RBI groundout by Evan Long. The Princes tacked on another run in the sixth. Darrin Shirk bounced a double off the walk in left center to lead off the inning. He came around to score on an error with Ochoa at the plate. With a 3-1 lead, Adkins let his defense get to work to help secure another scoreless inning. Joey Wenning tossed the final inning and gave up a pair of base hits. With one down, Long made a play to the left of second base. Long threw to Rydzewski for the force, but instead of throwing to first he threw behind the lead runner at third. The play resulted in a 4-6-5-2-6 double play and giving Wenning his fifth save of the season. The nightcap started with a pair of fielding errors and two sac flies by Kyle Slovik and Shirk, which gave HU a 2-0 led in the bottom of the first. Muskingum (12-19, 5-9) plated a run in the top of the fourth to cut the lead to 2-1. Heidelberg quickly responded with a single run in the bottom half. Joe Sefik was hit by a pitch and moved to second on a single by Ochoa. With two down, Rydzewski drove Sefik in with a bouncer up the middle and into center. Matt Psychas drew a walk in the fifth and advanced to third on a wild pitch while attempting to steal second. He later scored on a sac fly by Shirk giving HU a 4-1 edge. The Muskies inched a little closer with a run in the top of the seventh, but as the Princes did all day, they responded immediately. Long singled and worked his way to third. With two down and runners on the corners, Long scored on a double steal. Shirk came around to score on an RBI single by Sefik. Alex Sir Louis tossed seven innings of work scattering seven hits and striking out one.